We're a pack of savage, bloodthirsty scoundrels. No ranks. No rules. Loved by few, feared by many, gallant, disturbing, reckless, foul-smelling; all these and more have been used to describe our troop of plunderers by those we have terrorized over the years. 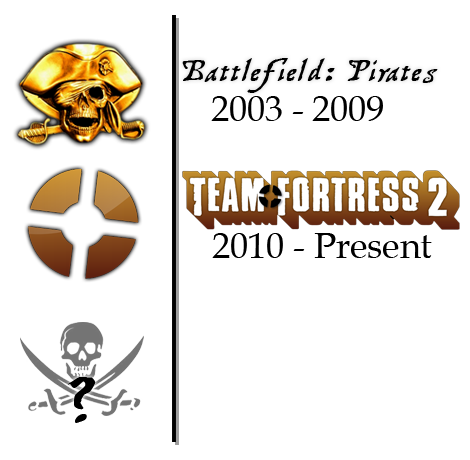 Since the summer of 2003, the Cut Throats have fought together here online, from our humble beginnings in the community of the Battlefield: Pirates games to the big world of competitive gaming and Team Fortress 2. CT is a gaming clan, sort of. 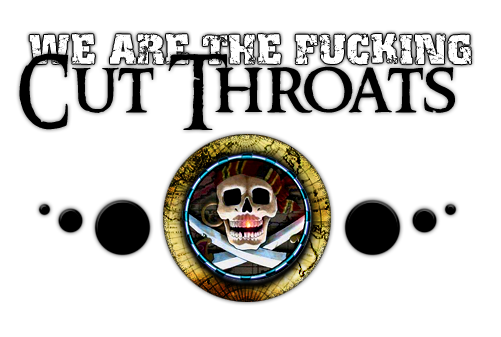 We have a long storied history in the competitive environment of BFPirates, but have maintained more of a community status for the majority of the group's timeline. These days we are titled a Pirates Gaming Community as the focal point that brought us together has always been the love of good plundering. Our members are primarily American, though we have members from all over the globe. We have always welcomed anyone into the crew regardless of age or nationality. Some Cut Throats are old farts, some young. Most of us formed this group when we were young, and are now getting through college, becoming old farts ourselves. Like the pirate crews of old, we the Cut Throats run a true democracy where all members are equal and important matters are handled by vote. Battlefield: Pirates was/is the greatest thing you could hope to do with your free time, besides actually sailing a boat around and stealing people's stuff. Initially released by Capt. Guy Smiley in 2003, this mod for BF1942 would go on to quickly manifest a core community on its homepage, BFPirates.com. With the formation of several clans (including our own, which formed first!) 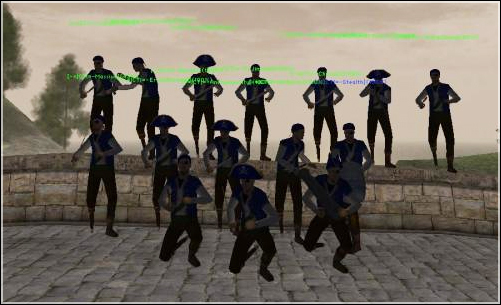 and upon gaining hundreds of members on the official forums, BFP took on more help and became the first and best of its kind: the pirate FPS. Players were given muskets, pistols, swords, giant ships, giant hats, balloons, evil komodo dragons, everything a pirate ever wanted. Thus, for years with the Cut Throats steadily gaining power and dominating the competition, all was great. We maintained the most popular public server and most of the time our forums activity beat out the official website itself. Unparalleled on the battlefield, we almost never lost a scheduled engagement. New recruits were abundant, the public was horrified, enemies were on the retreat; a golden age for the Cut Throats. During these years, the 'clan' was the keyword in CT's hearts and minds, and the clan was driven to make a name for ourselves and better the community. Of other clans, there were many. The Black Buccaneers, our biggest rivals, were a constant pack of skilled bad-guys to be measured up against. Swords Crossed, the most powerful group from Europe were a formidable bunch, being one of the only clans to beat CT in a straight-up clan match. Other notable groups include our friends the Drunken Elite, the Scurvy Dogs, the Bilge Rats, and all other manners of nautical-themed teams. While these groups were populated with wonderful people, it became difficult to keep the rage down at times. BFP was serious business. Tournaments took place. Events websites, map packs, addons, matches, mutiny's, power struggles, mystery, intrigue. Eventually the keys to the game itself were handed to our talented bunch, resulting in the CT-produced Battlefield: Pirates v1.0 Final. Our crowning achievement as a clan was the production of the final version of our beloved BFP, created with the support of the community and released to tens of thousands of downloads. This, of course, was years ago. BFP died out for a long time, between 2006 and 2008. For a breif time there, CT itself was waning; Battlefield: Pirates 2 was delayed for years and ultimately released to lackluster appeal. We tried multiple times to get down with the new BFPirates game, but our hearts just weren't in it and the game itself had issues. We wallowed in self-defeat for some time as the last pieces of the great Pirates community disassembled. 2009 brought a brief revival of Battlefield: Pirates on BF1942 and spurred by the members of CT, our group was revived. We became a 'clan' again for a while there, playing matches and organizing events. It would ultimately prove to be the last hurrah of BFP, but thankfully renewed the Cut Throat's interest in ourselves as a independent community. Still, a new game was needed. Now with the Pirates days behind us, the team is actively wreaking havok on the public on Valve's Team Fortress 2. We have found a game which embodies key traits necessary for a group like ours: a high level of violence, skill, ridiculousness and cunning. We enter into this new era of CT bold and determined to continue the destruction of those who would oppose us. All the while, amidst the perpetual killing on the CT server or elsewhere on the interwebs, the drones at our own Cut Throats Interactive slave on, producing new games and media from within our very own community. Talented individuals within the Cut Throats are working this very moment to improve the world for those who would like to pillage, and miss the days when it was readily available to us all. Does all that help answer some questions about this supposed 'Pirates Gaming Community?' If not, don't worry; you are probably going to get cutlassed soon anyway. If you would like to stay a while on the site, drop us a line on the forums and we'll hold off on hijacking your vessel and stealing your life / belongings long enough to get to know you. "Don't forget, it's just the beginning, people will come and go. Friends will even come and go. But They'll always be welcome and be a part of CT in whatever ways we evolve and grow. There will be fights, there will be arguments, but we're all mature enough here to work through them and move forward." Quote from co-founder -=|CT|=- Sparrow.